Hi all, just wanted to share an upcoming project with the community. If you notice anything wrong with the information below, please let me know! If there's anything specific you'd like for me to capture let me know as well. Thanks! Will update again when complete, hopefully with vid/pics. ASSUMED DIAGNOSIS: Pressure plate or clutch thrust bearing is worn out preventing complete disengagement of the clutch disc. 2) Sometimes from the reverse gear I cannot get it back to neutral; it gets "stuck"
My personal guess?? As the clutch disk wears out, it can warp and/or begin to come apart. That causes the clutch to drag and the fault doesn't lie with the pressure plate or throw-out bearing. You might find the friction material on the clutch disk is beginning to "fray" and maybe the disk material isn't even very thin yet. The PP & T-O bearing are just sensible to replace because its a big job to R&R the transmission. Also consider getting the flywheel resurfaced (just like resurfacing brake rotors). Technically we aren't supposed to have active links to selling sites that aren't sponsors, so I'm "fixing" your link. Hrm...I guess I'll have to dig in there to find out. I'll let you know what I find. Either way, good time to change it all, like you said. Noted. Will keep that in mind in the future. I don't think I've seen a "how-to..." thread about transmission/clutch R&R for the K-series engine yet. Looking forward to it. Saturday was well spent tearing the car apart getting to the transaxle (transmission)/Engine. This took WAY longer than expected -- a lot of unexpected things kept coming up, which I will explain in detail so that I can help ease some surprises for others looking to take on this job. Anyway, I got all the bolts off that SHOULD have allowed me to pry the transaxle from the engine but it's not coming apart. Standing in front of the engine, I can get some space in between the two but it's not budging in the rear. I'm guessing something is holding it together. I only took the drive shaft on the driver's side off. 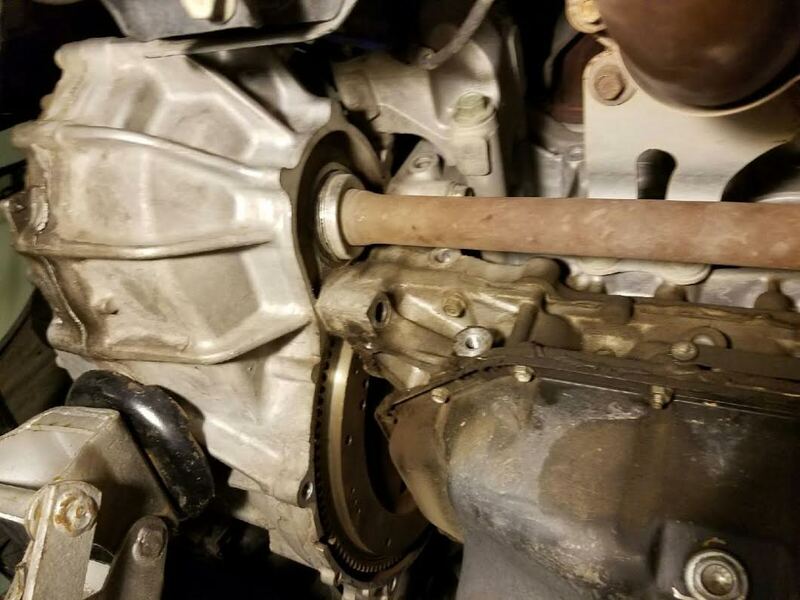 I'm wondering if maybe the drive shaft from the passenger side wheel (see attached image) is what is keeping it together? What do you think? Image was taken while crawling under the engine space headfirst from the front of the car. I am looking up into the engine towards the left (driver side). At the bottom left is the jack placed underneath the transaxle/engine. At some point that shaft is going to need to come out, so you might as well go ahead and remove it. Do you have a service manual to help with everything? Ugh. Was in the process of removing the other wheel's spindle/axle nut and my breaker bar BUSTED. Delayed yet again. Yeah, I have a service/tech manual. It's been really helpful. Going through that thing is like reading a "choose your adventure" book that never ends! "Remove transaxle mount (See Chapter 10)"
"Remove control arm (See Chapter 8 Section 3)"
"Remove stabilizer (See Chapter 2)"
Still, having a fun time learning and seeing what's what. I think I'll post my progress thus far when I get a chance tonight. UPDATE: Weekend project has turned into a two-week project. Mostly due to learning curve and understanding how to RTFM. Also, it doesn't help having a busy life that keeps me from spending a lot of time in the garage. Good news is that I was able to replace the clutch disc, pressure plate, and throw-out bearing. I'm in the process of putting her back together and am running into some issues. Issue: I am installing the starter motor back and I'm having trouble getting the long bolt back in. The manual has torque recommendations at 33 ft lbs and I'm currently at 50 ft lbs. It's gone in more than half way and I don't want to push it any further for fear that I might strip the threading and/or break the bolt off. My initial assumptions are that the transaxle and engine are misaligned every so slightly. However, when putting back the transaxle back to the engine I've had no other fitting/alignment issues. Anyone have any ideas as to why this might be happening? Sorry for the late reply. I realized on the actual starter motor itself there are no threads. It's just a hole that the bolt slides through and tightens into the threads on the transaxle. I found out that the reason why I was having issues was because I had stripped both the bolt threading as well as the hole threads. I got it fixed and pushed through. Thanks for the reply though.